Hands down, the thing I love most about my job is all of the creatives that are brought into my life who enrich and inspire me. Ana White is definitely one of these people! 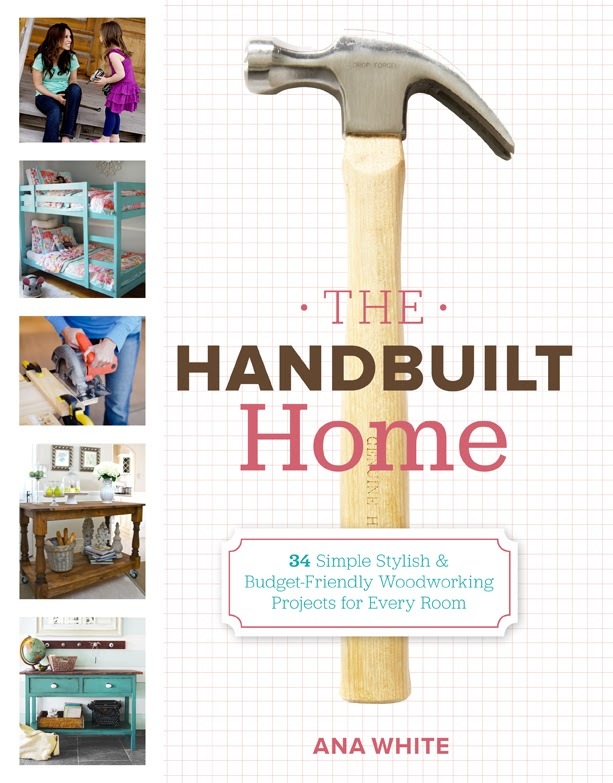 I am so proud to be able to help Ana promote her new book, The Handbuilt Home. Ana’s book is full of brand new plans to help you save money while furnishing your home. There are 34 project tutorials carried out by some of your favorite bloggers! You are bound to recognize many of the faces in Ana’s book who brought life to her furniture plans. The book is geared towards every skill level and even has two full chapters of technical information including Ana’s favorite tools and supplies, building techniques, and even help picking out your materials. Below is a short video with more info on the book! Right now Ana is on her book tour at several Home Depot stores across the country! If you are lucky enough to be near one of the cities she is visiting, be sure to stop by and say hello. The Home Depot is also generously providing free books at events with purchase of $20 while supplies last! Would you like a chance to win a copy of Ana’s book? I get to give one away to one lucky Home Stories A to Z reader! Simply follow the directions in the Rafflecopter widget for your chance to win a copy. 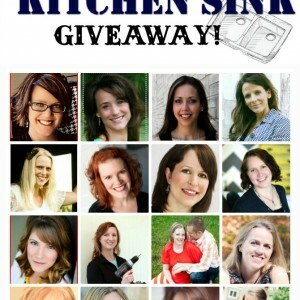 Everything and the Kitchen Sink Giveaway! Would love to learn to build a side table for my dining room! I’ve already built a bed and a sectional, but I’d love to replace everything in my house with furniture that fits the space and functions well. a bed for my husband and i.
I want to build the parsons desk! I need some bookshelves! Thanks! I would love to learn how to make one of those little kid chairs. So fun! I’d love to build some outdoor furniture. The farmhouse table would be way cool! I’d love to use her plans to build a new kitchen table. To start I just want to build some shelves for my craft room. Then maybe a craft table similar to the table my father-in-law made several years ago. It wasn’t fancy, but was the perfect height for working, had lots of leg room underneath but still had a shelf. I’d love her plans! I can’t wait to see her book. My ultimate project would be a big ‘ol banquet table from reclaimed wood. Thanks for hosting the giveaway! I would love to learn to use a Kreg Jig and build cabinetry for my home! Really needing a hall tree for our entry, but its a narrow space, so can’t find one to purchase that would fit. Would be great to be able to build one. I so need to learn how to build a nightstand. The one I have doesn’t work for me at all. I have so many meds, books, things I like to keep near me at night that it becomes a jumbled mess! I’ve seen many of Anna White’s projects done by lots of my favorite bloggers! Would love to win her book! I would love to learn to build media cabinet! I would love to get a bench built up next. I’d love to build my son a bunk bed. My sister told me about Ana White! Love her!!! I’d love to build a platform bed with drawers or a small entryway bench type thing for my kids’ stuff! I would love to build a bed out of pallets. And a headboard out of doors. I would love to learn to build some cool end tables for the basement we are finishing right now! I want to make a swinging bed for our back porch!! A dining table would be my pick! Tools are waiting . . .
An X back sofa table. I’ve never made furniture, but her piece is exactly what I’m looking for! I would love to build built-in shelving. My hubby is usually the carpenter.. but I would love to build a craft station to spend some mommy time! I love Ana! We built a coffe table that turned out awesome from one of her plans. People don’t believe when we tell them we built it. We (and by we I mean my hubby) are in the process of build the farm house style bed and next we plan to build the farm house kitchen table. I did get inspired and got over my tool fear and I actually built two side tables. Cabinets for sure and maybe a headboard too! Thanks so much for the chance to win. I’ve been an Ana White project fan for a long time! I’m needing a new TV cabinet, and I’d LOVE to build it myself! I’d love to learn to build side tables or console tables! I love Ana’s site and I have a few builds already planned in my future. I am currently working on an upholstered bench, can’t wait to finish! A bench for my deck would really come in handy! I would love love love to learn how to build a bed frame and a chunky table. I would love to learn how to build my own farmhouse style dinning table! I’ve been wanting to build a bench for a while now, but I haven’t been brave enough to try it yet. I’d love to learn to build a dining table and banquette for our dining area! I would love to learn how to build chase lounges for our patio! We want to use Ana’s plans and build a new dining table before Christmas! Getting this for my dad for Christmas! I’d love to make my own outdoor table for our deck. She’s got a couple to try! i’d love to make custom built-ins in the family room… shelves, doors, cabinet… the whole shabang!! I would like to built a headboard for the guest room bed. I know Ana has some nice plans to choose from. Thanks for the chance to win her book. We already did a media cabinet from her website and I live it. But now I want to finish that project and build the hutch for it. I’d love to learn to build a bed. We’re actually going to use your design to build a new bed for our daughter and I can’t wait! I want to build some custom bookcases and a gorgeous Lydia daybed. Oh man, they’re ALL on my list, but I better start small with something like the farmhouse bench. That would really simplify things around the dinner table. I have so many projects scrambled in my head right now, but one thing I really want to try and build is the mudroom lockers. I have 4 kiddos and that would help with heavy winter coats and backpacks so much. The farmhouse bed is definitely on my to-build list! I’m looking for a great MCM dining table… hopefully one that can be built for less than furniture store prices! The rafflecopter is no where to be seen? I would love to learn how to build a big farm table. Or cute bench! I would love to build the outdoor bench! I want to build a bookcase. I’d love to build an outdoor bench. I would like to build the farmhouse table!!! I’d really like to learn to make STURDY kitchen chairs that look fantastic! How exciting! I’m totally going to go see her when she comes to Fairbanks! I think I would start with a bench and work myself into a bunkbed for the kids. Awesome. I would love to make a helper tower for my daughter! I need a coffee table for the family room and would love to make it myself. Thanks for an awesome giveaway. I would love to win a copy…I have long admired that site and plans from Ana White! I’d love to build the kid helper tower! The kind the kids can stand in to be counter height in the kitchen and still be safe! I would love to learn how to build a farmhouse table! I’d love this book. Recently been trying new things in my home. This book sounds like fun! Oh I would love this to share with my husband. We want to learn how to do things ourselves to save money. We both are going overseas for the military and would like to have our dream home and furnishings planned out to build when we return. Right now we are gathering ideas and he is gathering tools, lol. I ‘d like to tackle a headboard. My husband already has a hard time getting me out of lowrs and Home Depot. Ladies night, do-it-herself workshops, shopping trips. He knows when i say “shopping” , I really mean HD/lowes. It’s like an addiction. I used to joke with him that nothing says I love you more than a trip to Home Depot. Ok seriously, could you imagine the damage I cod do in there with that book. Ridiculouslessness! First project, a bed format 2 year old. Imight get out of control. Or maybe I might get out of control! I would love how to build a book shelf. My mom has a hand made one in her living room that I’m so jealous of! I would love to build Ana’s knock off Pottery Barn 4-poster bed! 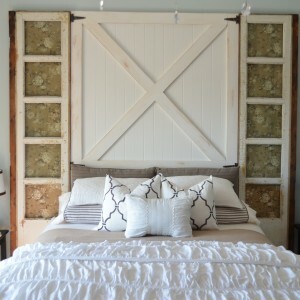 I would really like to learn to make the farmhouse bed– it would look great in my guest room! I can’t wait to check out this book. I’d like to build a dining table for our dock. I can’t wait to check out this book!! It looks fantastic…i want to learn to build cabinets…so i can customize my kitchen!! I would love to learn how to build a console table! Oh,and I’d love to build something with a drawer, I’ve never done that before. I have so many projects I want to do. First on the list is a wood headboard for the master bedroom, then I want to build some shelves and a coffee table to the living room. There is a lot more on the list, but those are on the top of my list. I would love to build my own rustic tv stand! I would enjoy building cabinets and a table! I’ve been inspired by Ana’s website, but have yet to actually make something. I would love to have the book in hand as I made my first project. I would love to learn how to build bunk beds and console table!!! I would love to try an upholstered headboard for my daughter. I would love to learn how to build those bunk beds!! HI, I would love to find a headboard to build! Hi Beth! I’d like to build a cabinet. I LOVE Ana White! I’d love my first project to be a Ben Franklin chair. It’s a chair you fold into a steps tool. I love Ana White!!! I cannot wait to see this book! I’d love to learn how to build a bench!